Beautiful, supple, butter-soft…there’s a real sense of intimacy in working with leather. And our appreciation of this wonderful, versatile material has only deepened over the five generations we’ve spent together. We select and inspect every single hide we work with individually, making sure each one is flawless and perfectly suited to its purpose, whether we’re making a touchably soft handbag or a rugged and durable travel bag. The beauty of the leathers we work with is enhanced using premium waxes and dyes that bring out the exquisite natural subtleties of the hide and protect the bags we make from the rigours of everyday use. Our knowledge and passion for the finest full-grain leather infuses every piece we create, and every stitch that goes into our bags. The result? Masterpieces of design and quality, created right here in the heart of Britain. Our signature business case leather, Sundance Floodlight is aniline-dyed side leather with a high wax content, which is infused during the tanning process, and a waxy top finish that showcases the natural grain. This leather starts with a relatively conservative matt finish and, over time, develops a wonderful patina with a gentle sheen. Its high wax content makes our Sundance Floodlight a very robust leather that will withstand the toughest lifestyle. Our distinctive Aztec Crazyhorse leather is the one to choose if you like your bag to look like it’s got a few stories to tell! Hot-stuffed with oils during the tanning process, this distressed appearance leather has a lived-in look and is our very toughest leather. Take it anywhere, do anything, in any conditions and it will keep coming back for more, getting ever better-looking along the way. Atlantic is a lovely, smooth and versatile leather which lends itself beautifully to a wide variety of pieces, from our smallest pouches to some of our largest luggage pieces. Crafted from carefully selected hides, and with a softly polished finish, our glossy Atlantic leather allows the natural beauty and richness of the hide to show. Atlantic is softer than our Bridle leathers and lighter in weight, while still very robust, making it an exceptional choice for luggage and handbags. The traditional English look is exemplified by our canvas and leather combination pieces. Our robust sail canvas is a 24oz cotton fabric that’s custom woven and dyed for TUSTING. The fabric is then laminated to a waterproof backing, making this a distinctive and extremely hardwearing body material. Available in Safari Tan, Olive and Lichen Green, each trimmed with a co-ordinating leather, our fabric bags are highly attractive and incredibly durable. The linings in our bags are all fashioned from attractive, hard-wearing quality fabrics. We use strong cotton twill to line most of our luggage pieces, whilst briefcases, totes and handbags feature our signature jacquard lining. Waterproof nylon is used to protect the interior of our wash bags and pouches. 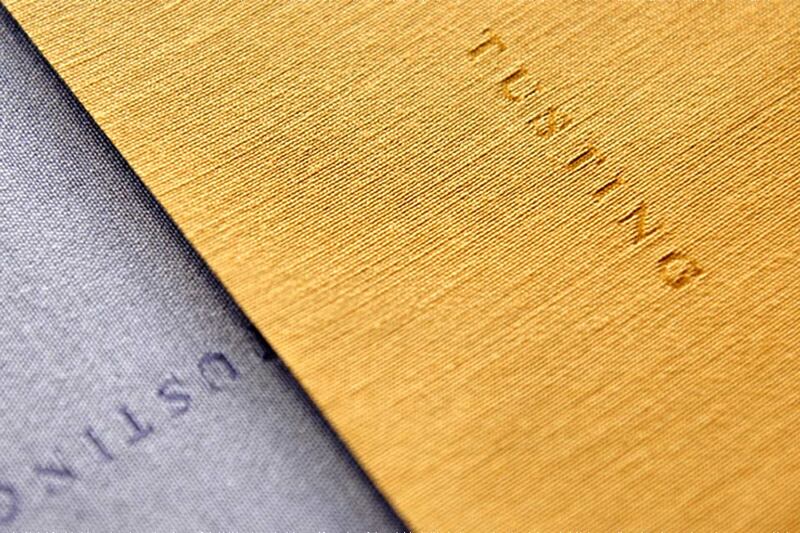 We’re also happy to incorporate customised linings in our standard TUSTING pieces – take a look at our bespoke service for more information. While we can sing the praises of our beautiful full-grain leathers, sometimes there’s nothing like getting your hands on the real thing to decide which one is perfect for your new TUSTING bag. If you’d like to be introduced to our wonderfully tactile leathers before you order a bag, we’d be happy to send you swatches of some of the leathers and/or fabrics that we use. Alternatively, we’re always happy to welcome customers to visit us here at our factory, where we can discuss your requirements in detail. Please contact us to request swatches or arrange a visit.